Beer is the world's oldest and most popular alcoholic beverage. 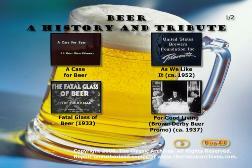 This DVD aims to explore our culture around beer, and the manufacture of. As a wise man once said, "Mmmmmm, Beer, it's nature's fruit juice." Beer is the world's oldest and most popular alcoholic beverage. Some of the earliest known writing refers to the production and distribution of beer. It is produced by the fermentation of sugars derived from starch-based material — the most common being malted barley; however, wheat, corn, and rice are also widely used, usually in conjunction with barley. Less widely used starch sources include millet, sorghum and cassava root in Africa, potato in Brazil, and agave in Mexico, among others. This DVD aims to explore our culture around beer, and the manufacture of. You will see films about underage drinking, about the brewing process, some advertisement examples, and some of the dangers of drinking and driving. A good overall overview of beer's place in our society. A must have for any beer lover! A cautionary film for convenience store owners about underage alcohol sales. Watch teenagers try to sneak some beer, and what the clerks need to be wary of. Beer promotional film. "Sparkling, golden, pure, refreshing, a beverage as old as history." Mr. Snavely, a Yukon prospector, lost his only son years ago to the temptations of the big city; now the prodigal Chester, released from prison, comes home to Ma and Pa. A parody of Yukon melodrama; includes the famous looking-out-the-door routine. Sales promotional film for Brown Derby beer, a house brand of Safeway Stores; shows the brewing process. A promotional film made for Pabst Brewing Company distributors. Short television commercial for Labatt's beer. Reveals the dangers of drinking and then driving. Shatters the myth which says you have to be drunk before your driving ability is materially impaired. Incorporates statistics compiled by the National Safety Council and American Medical Association.